Prefect charging for Apple Watch and Qi-enabled phone. Enjoy the convenience of wireless charger with EXCITINGPOWER Apple Watch Wireless Charger! Simply placing your devices and begin charging instantly. Built-in Magnetic Charging Module aligns your Apple Watch magnetically. Compact and elegant make it suitable for bedroom and office usage. 1. Using QC3.0 or QC2.0 Wall Adapter. Using QC3.0 Adapter can shorten the charging time and improve charging efficiency. 2. Please check and avoid placing any metal attachments or any cases thicker than 0.3 inches. 3. The charging efficiency is closely related to environment temperature. 4. Do not support Apple watch series 1. 2 in 1 MULTIFUNCTIONAL WIRELESS CHARGER: One charging pad, can charge two devices at once. Our fast wireless charger station supports both Apple Watch Series 2/3 and all Qi-enabled smartphone charging with high speed efficiency. 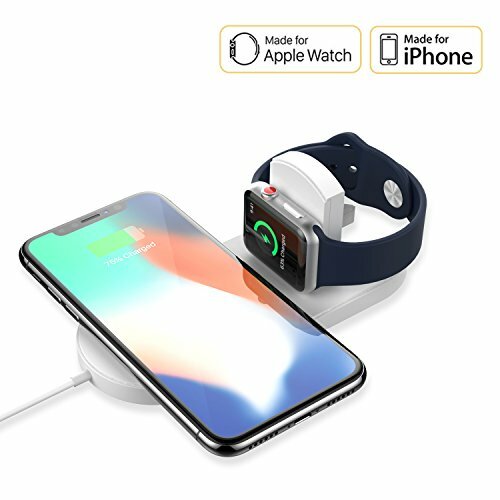 FAST WIRELESS CHARGER & UNIVERSAL COMPATIBILITY: Our apple watch charging stand Support 2w charging for Apple Watch Series 2/3, 7.5w quick charging for iPhone X, iPhone8/8 plus,10w for Samsung Galaxy S9 Plus S9+ S9, Note8, S8, S8+/S8 Plus, Galaxy S7, S7 Edge, also other android Qi-Enabled Devices. CONVENIENCE & FOLDABLE: Simply place your phone on our wireless charging pad, surely can with your extra-tough cases. (Metal attachments or credit cards will interfere with charging). The 0 to 90 degree adjustable and foldable design makes it support Nightstand mode of Apple Watch Series 2/3. Compact and light-weight design, make it portable and easy to carry. SECURE CHARGING & DURABLE: Our apple watch charger equips with outstanding over-voltage and over-heat, over-charge technology. Antiskid charging pad keeps devices from sliding off and charging safe. PACKAGE INCLUDE: 60-day free replacement policy, 18-Month warranty and hassle-free service support, EXCITINGPOWER Apple Watch Wireless Charger Pad, user manual (Wall Adapter not include). If you have any questions about this product by EXCITINGPOWER, contact us by completing and submitting the form below. If you are looking for a specif part number, please include it with your message.